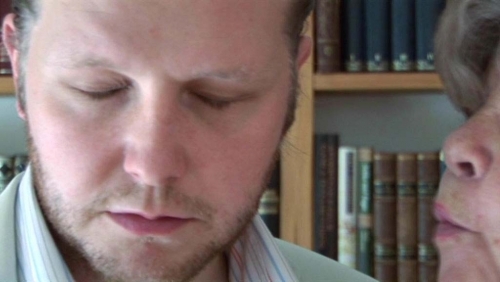 Ragnar Kjartansson in "Out of the Retina, Into the Brain: The Art Library of Aaron and Barbara Levine"
Ragnar Kjartansson, video still from Me and My Mother, 2005; video. Duration: 3 minutes 40 seconds. Ragnar Kjartansson's Me and My Mother (2005) is included in "Out of the Retina, Into the Brain: The Art Library of Aaron and Barbara Levine." This is the first in a series of collection-based exhibitions happening at the Art Institute of Chicago exploring connections between photography and other creative fields. Aaron and Barbara Levine’s Washington, DC, home and all its contents form one great art library. The couple has spent thirty years collecting postwar and contemporary art. Objects small and large line the walls or perch on tables, shelves, and other areas. Many of these works belong to the history of conceptual art, in which thinking about the meanings of art is as important as the visual—retinal—sensations gained by looking. Plentiful as they are, works of art in the Levine home are far outnumbered by books—some 7,000 at present. While many of these volumes are about artists and art, others are by artists and were made as works of art in their own right. Like many of the works on the Levines’ walls, nearly all their books also foreground photography—used to make the illustrations—and language. The Levines are particularly drawn to books conceived as portable sculpture, and they approach publications and works of art in a similar manner, as objects to study and learn from.